I must have read the whole Burroughs opus before I was fifteen. 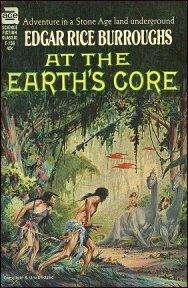 (I’m not at all sure I could manage it now, any more than I can still read authors like Robert E. Howard, who I adored beyond reason.) 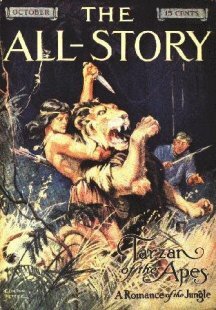 I soldiered right through ALL the Tarzan novels, with their endless succession of lost anachronsitic empires and malevolent but seductive princesses, purchased (I still have them) the DoubleDay hardcover book club editions of his Mars series illustrated by Frank Frazetta (much of my pocket money went to mail-order books), hunted down and found nearly all the old Ace paperbacks with Frazetta covers and the funny red lettering with the spiky bits. 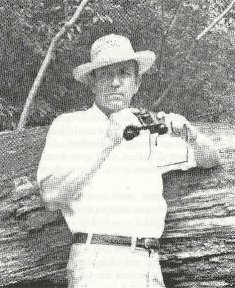 Burroughs was nothing if not prolific; he wrote at an astonishing speed, being the master of the cliff-hanger ending, leaving readers positively baying for a sequel. 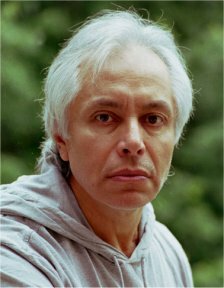 He wrote twenty-three for Tarzan alone. Weighing in at a good 15 pounds (with slipcase) the Library is a compendium of the artwork produced over the years for various Burroughs novels. 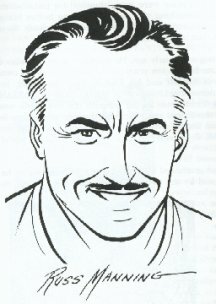 J. Allen St. John, despite the occasional criticism, was ERB's favorite illustrator. 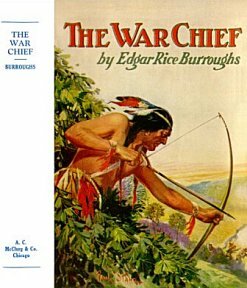 In July 1927, Burroughs sent his editor a scathing letter of reproof about the cover painting for The War Chief which had been done by Paul Stahr, a St. John replacement. “The figure of the Indian is not of an Apache, it does not look like an Indian and is as homely as Hell. I did not mind so much when I saw it on the magazine cover, but I was nearly sick when I saw that you had adopted it for the book, as I was sure St. John would do something really worth while for it. There is nothing of the atmosphere or colouring of Arizona in the foliage or background; in fact the whole things is atrocious and if the picture can kill sales, I am confident this one will." In the increasingly heated exchange of letters that followed, ERB added "You do not have to tell me why this jacket was selected. It was solely because it was bought cheap… and a couple of hundred dollars saved." Delaware artist Frank Schoonover (1877-1972), though more readily associated with the likes of James Fenimore Cooper, also did a few illustrations for "A Princess of Mars" in 1917. 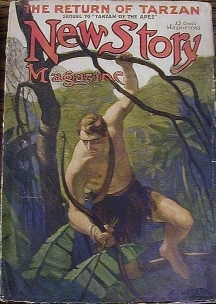 There is even, astonishingly enough, Tarzan art by N.C. Wyeth -- the covers of "New Story Magazine" for The Return of Tarzan, in June and August 1913. 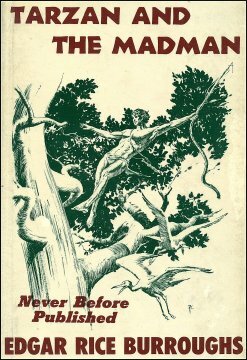 The Return of Tarzan was serialized by over seven issues between June and December; his cover for the first installment is presumed lost, indeed I've only ever seen the one that is familiar to everbody. (Additionally, he did a cover for All Story magazine’s publication of "The Outlaw of Torn" in January 1914.) Burroughs wrote to enquire about purchasing the originals, and was told it was an unofficial "custom of the house" to sell them for half of the fee paid the artist -- in this case, fifty dollars each. Burroughs could not pay the amount and let the matter drop. In 1965, Hulbert Burroughs' curiosity was piqued by the mention of the Wyeth cover, tracked it down and purchased it for $1,500.00. 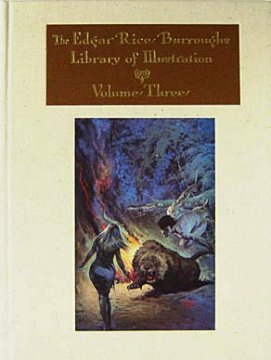 Volume Two kicks off with the competent and often elegant but rather tame Tarzan illustrations by Studley O. Burroughs, son of ERB’s older brother Henry. 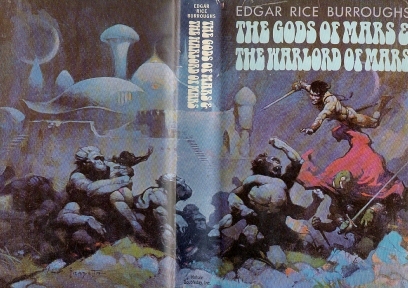 Studley’s style was ill-suited to ERB's demands and ERB supplied agonizingly detailed resumés of what he wished to see on each cover. 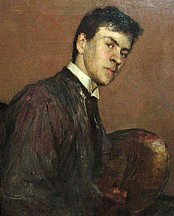 Replying to a submission of sketches, he wrote "Do you object to my telling you exactly what I wanted? I know some artists do." 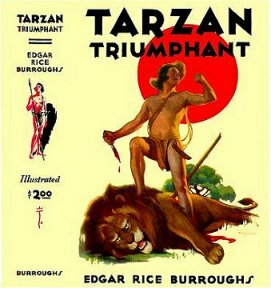 When he saw the finished cover of Tarzan Triumphant, he had this to say: "He is too prissy and has a belly on him almost as large as mine… Tarzan Triumphant looks as though he might be several months along towards an increase in the family…" In passing, he criticised St. John, blaming him for dropping sales, seeming not to take into account the deepening Depression. "If you have any of my former books I wish you would note the almost total loss of outstanding sales value in St. John's jackets. As works of art they seem to me about all that could be desired, but as outstanding, compelling attention attractors they are not so hot." Studley's drinking problems (and doubtlessly the feeling of working for an ungrateful -- and close family -- client for low fees and too few kind words) ended up resulting in missed deadlines and disappointment. Eventually ERB dropped him and took up again with St. John. 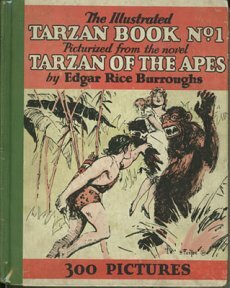 The first Tarzan comic, syndicated in 1929, is done by Hal Foster, each strip (60 in all) being a handful of vignettes with text below, the very early beginnings of the daily comic strip. Foster's next contribution, full-sized Sunday pages, still has no word balloons, but a far looser layout, with dialogue in quotation marks inside the panels. 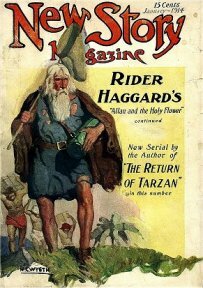 He kept at it from 1931 to 1937, before moving on to Prince Valiant. 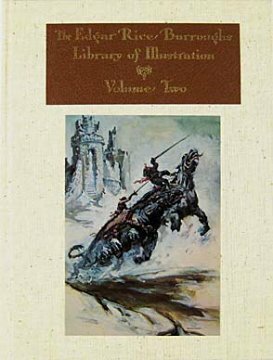 Volume Two is very largely dedicated to the illustrations of John Coleman Burroughs, Edgar's son, whose work, alas, is uninspired where it's not simply mediocre. 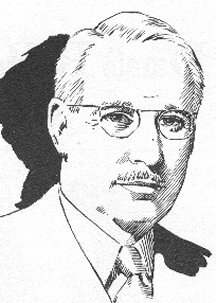 ERB dropped J. Allen St. John in favour of his son, with editors no doubt heaving a sigh of relief, spared the unenviable role of the middle man trying to placate the sensibilities of both parties. (And in the end, probably not caring so much what went on a cover as long as it sold well.) 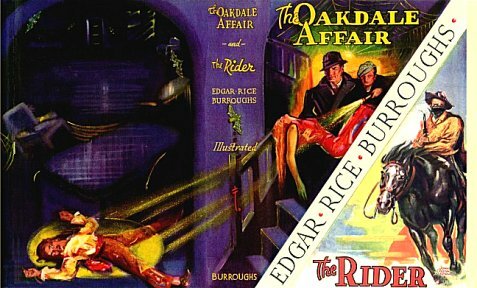 In 1937, John did his first Burroughs cover for The Oakdale Affair and The Rider. In the words of ERB "...it has always been the ambition of my son, Jack, and myself that one day he would illustrate one of my books. He is doing very excellent work, and I am having him illustrate the Spring book for us." John Coleman Burroughs went on to illustrate practically everything, over one hundred paintings in all. (Curiously for a stickler like Burroughs père, EVERY depiction of a bow and arrow is wholly wrong.) 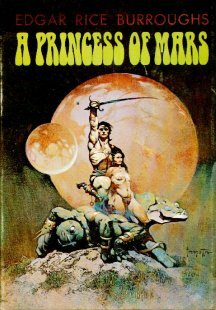 There is also a generous selection of John Coleman Burroughs' John Carter of Mars and Pellucidar comics (over-generous - nearly 100 pages). 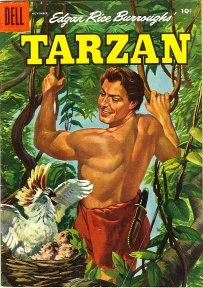 The book is rounded off with Dell Comic Tarzan covers by Morris Gollub, whose Tarzan looks very much the 1950's Charles Atlas type, clean-cut and wholesome, but not particularly inspired. 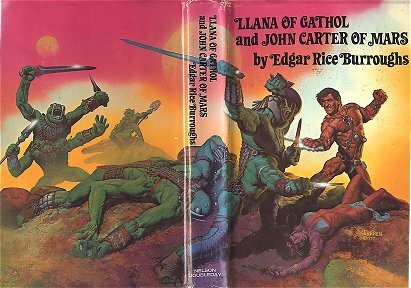 Volume Three sums up with the idols of my teenage artist-hero worship: Frank Frazetta and Roy G. Krenkel. 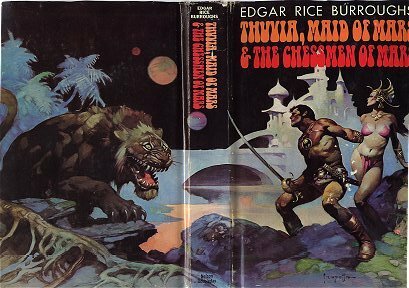 (I never warmed to Reed Crandall, who only did work on the Mars books because Al Williamson, the illustrator originally considered, was too busy.) I of course missed Hal Foster (he was far happier doing Prince Valiant anyway) and his successor Burne Hogarth (but quite frankly, his unrelenting action poses in every possible situation are tiring after a while, as are the wooden faces of his protagonists. How Tarzan maintains those astonishing stances with both feet so consistently planted firmly on the ground has always been beyond me), but assiduously collected Russ Manning's Sunday colour pages. 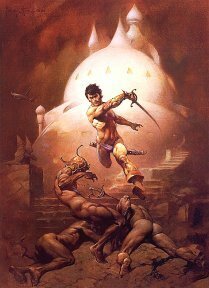 Naturally, Frazetta’s work recaptures the magic, absent since St. John. 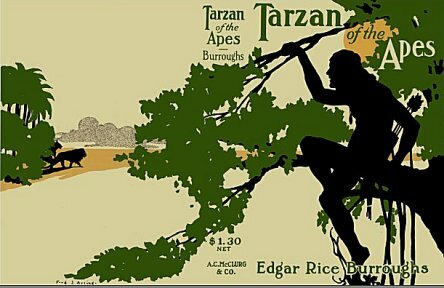 The earlier Tarzan work from the 1950's is in watercolour, before his switch to oils and the full development of his trademark style. One wonders what Burroughs would have thought. Likely he would have approved wholeheartedly. 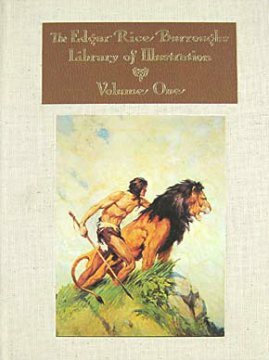 In the same volume is J. Allen St. John's last Tarzan illustration a pen and ink rendering of "Tarzan and the Eagle" after the 1919 colour painting done for Jungle Tales of Tarzan, done in 1957, the year of his death. So why this double detour, both into my teen fantasies and the age of pulps? Well, I’m like everbody else, I thought I was pretty well-informed. But, as usual, it turns that there's always a lot more behind a few pictures than you ever imagine. And besides, detours are always worth taking, they never do lead where you expect. 2Links to these artists will lead you to Jim Vadeboncoeur's truly excellent Illustrators site. 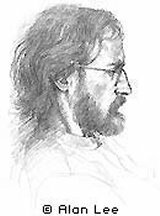 Not only does Jim provide a concise introduction to each artist, but he furnishes ample links for further reading and research. Also, if you are an admirer of the Golden Age of Illustration and you don't have EVERY copy of ImageS, then you must do some catching up. 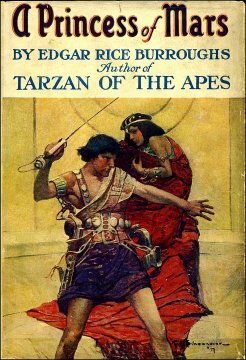 For a thorough immersion (take a deep breath) in the ERB universe, go to the official Edgar Rice Burroughs web site. Biographies are difficult, and hard facts generally pretty rare. So, welcome to the strict minimum. 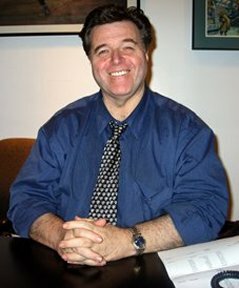 Born in 1957 in Vancouver, grew up in British Columbia. but he does play awfully good classical guitar). will be found on my Web site. topics throughout ERBzine by entering appropriate keywords.